Everyone wants a healthy, bright white smile, but the reality is that over time teeth can become discolored and dull. The team at El Cajon Family Dental can help you bring back your sparkling white smile. Teeth whitening treatments are very common because it’s so easy to stain your teeth. So many of your favorite beverages can steal the shine from your pearly whites including coffee, tea, soda, and wine. Luckily teeth whitening treatments are relatively easy and affordable. For best results you should consult with a dentist before trying any over-the-counter teeth whitening system. As a first line of defense, you can try over-the-counter treatments. Start with whitening toothpaste that may have special chemical or polishing agents in it to help whiten teeth slowly over time or to help maintain the results of a recent professional whitening treatment. For faster results you can try disposable whitening strips that can help you lighten your teeth a few shades. However if you have darker, or more stubborn stains you may want to try a teeth whitening kit. This kit may contain a tray that fits over the teeth as well as whitening solution. Professional-grade teeth whitening kits usually produce good results and can whiten your teeth up to 2-3 shades. For darker stains, or if you need to see results fast, over-the-counter treatments aren’t going to be enough. At El Cajon Family Dental we can give you a bright, white smile without all of the hassle of at-home treatments. Here we offer the very popular professional Zoom! teeth whitening treatment. Before your teeth whitening treatment it is recommended to have a check-up and a regular dental cleaning. During your in-office treatment a tray is worn on the top and bottom teeth containing the whitening gel. Patients will then relax during 3, 15-minute cycles under the Zoom! Light. You don’t even have to worry about sensitive teeth because the Zoom! whitening system has different settings to accommodate each patient. Professional Zoom! 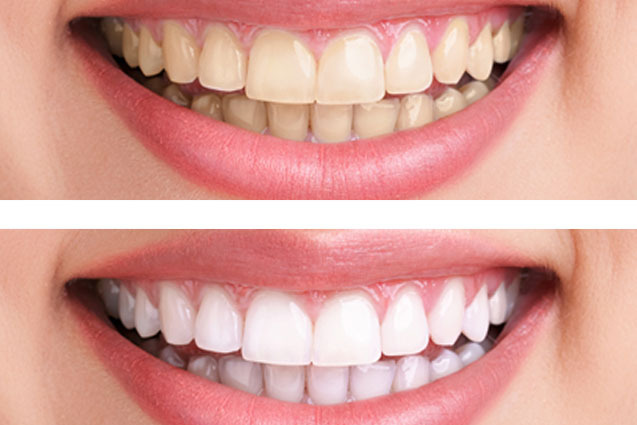 teeth whitening can get your smile up to 8 shades lighter in just one treatment. Get the beautiful, white smile you’ve always wanted with professional teeth whitening. To find out more about professional teeth whitening treatments, contact Dr. Mechael and her knowledgeable staff for more information. Regularly valued at $299. Includes a Free Take-Home Whitening Kit!